Shining and extremely beautiful is the salad set that we offer and it has spoons that are used to easily serve the salad. The set is such that it would serve you for long years without any complaints. Owing to the efforts of our dedicated team of professionals, we have been constantly engaged in offering the best quality Brass Spoon Salad Set. We are engaged in manufacturing and exporting a wide range of Designer Salad Server to our most valued clients. Our Salad Server set are made up quality raw of material and available in various designs and shapes. Also available at competitive prices. Our organization is offering a wide assortment of Salad Server to our clients. Our client can avail high quality range of Aluminum Salad Server. It is most appreciated and acknowledged due to its perfect polishing. Our range is manufactured by using optimum grade factor inputs and latest technology under the strict supervision of our experts professionals as per the global industrial norms. Mirror polish salad servers. 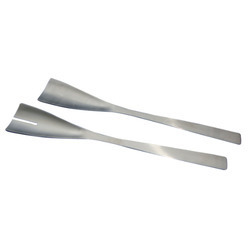 these high quality hand polished aluminum salad servers make a gorgeous addition to any table setting. As per the client request, it can also be supply in a black color gift box. The Cross Design Salad Server Set provided by us is easily accessible to clients in classy and elegant designs.